You are here: Home / Adam in the Media / *EDIT* Adam Lambert’s “Welcome To The Show” – Already #46 on iTunes! NOW #26!! 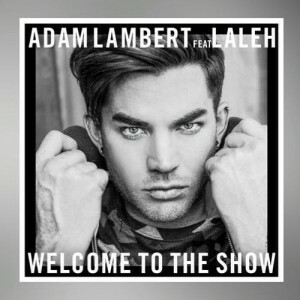 Adam Lambert released his secret single, Welcome To the Show (feat Laleh) at midnight last night, and just 12 hours later, is already climbing the iTunes charts. A few hours ago it was #60 and now it’s #46. If you haven’t bought it yet…what are you waiting for?!? Click here to listen the the interview. The only bad thing about this interview was Ryan saying it was the last time he would be on the Idol stage with Adam. Can this really be true? Won’t all the Idol greats be on stage at some part of the series-ending 2-day finale in just 3 short weeks? Cross your fingers for a surprise! Tell us below what you think about Welcome To The Show! What a voice!! He’s one of the great performers today!! I do like the song, although like so many pop songs, the lyrics are too few. I like heavy lyrics that don’t repeat too often. I felt this about Ghostown. But Adam could sing the phone book and I’d buy it. I’ll go on iTunes tomorrow and buy a few copies. How was the performance? I was gone all night and I can’t watch it until tomorrow. I have it taped. It’s nice that he’s releasing new music between albums! Went to the rehearsal of American Idol today, Adam was wonderful and it was sooo good to hear him sing live! Too bad it’s the last time I’ll be going. Looking forward to seeing him at the Orpheum! And hopefully meeting some of his fans beforehand up the street for dinner! He looked and sounded great on Idol and got a standing ovation….sung twice…did a short bit of Mad World when the show opened. Later in second half of the show he and Laleh did the song…it was great and he looked very cool. I loved Mad world then and now. I know the girl helped him write it but I think it would have been better if he sang the whole song alone. His voice was so much better than hers and he did it so much better. After saying that I loved seeing him and always will. I like the song…BUT don’t love it. I’ve listened approx. 10 times now and I just wish that it was more fast pasted and more catchy! Through his albums he has plenty of mid tempo songs that would be difficult to dance too. I’m not looking for dance music from Adam per say…but in order to get the much needed global radio airtime to really bring him into the limelight in a strong, competitive way he needs to bring it! he needs to rock it a bit more! Saw him in concert with Queen here in Vancouver! NOW THAT”S WHAT I”M TALKIN ABOUT!! !